Need a Generator Installation? It's Gotta be Reliable. Tired of being stuck without power during an outage? A standby generator will give you peace of mind that your lights (and whatever else you need to power) will stay on—even during Atlanta’s toughest storms. Our electricians take the time to discuss your needs, so you’ll get the most reliable backup generator for your home. Deal: Whole-home Briggs and Stratton standby generator starting at $84.99/month. Pay no money down and get free lifetime repairs and maintenance. Want free generator service for life? Contact us online or call us at (770) 594-9969 to schedule an appointment. We'll call you to confirm your time and send you a confirmation email with a picture of your electrician, so you know who's coming to your home. Your electrician will discuss your electrical needs with you. Then, they’ll give you multiple generator system options and straightforward pricing for each. Determine the safest location for your standby generator. Install and secure your new generator. Test the generator to make sure it works like it should. Could we have done something better during your generator installation? Let us know in the follow-up survey. We’ll do everything we can to make it right. At Reliable Heating & Air, we install only the most reliable backup generator brands. 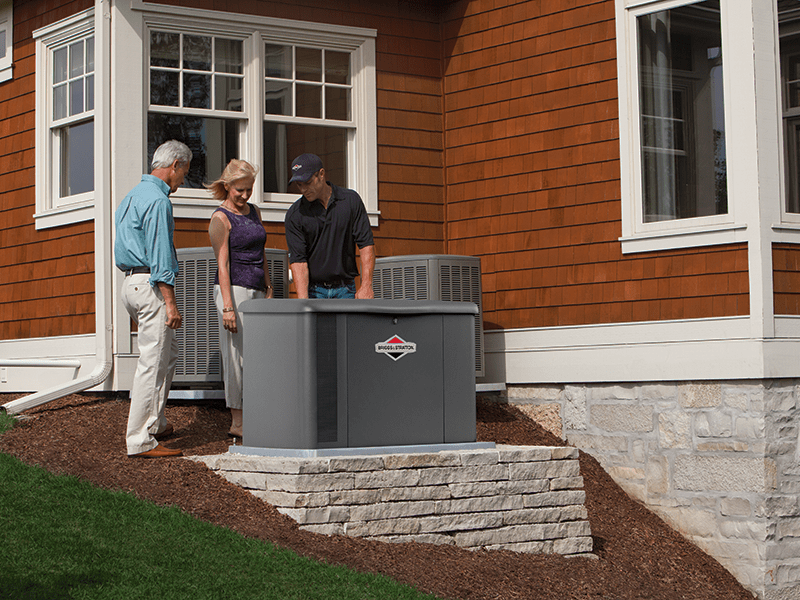 We find the right generator for your needs whether it's a Generac or Briggs & Stratton. Do you have a specific brand of backup generator in mind? We can probably install it. Let your electrician know and they’ll be able to tell you whether or not the brand you have in mind will work for your needs. Like it does for any home appliance, size matters when it comes to a residential backup generator. A generator that’s forced to supply more electricity than it can handle could get overloaded, which could damage not only the generator but also your expensive home appliances. On the other hand, a generator that’s too powerful for what you need will cost more to install and operate. Determine all fixtures and appliances you want to power during an outage. Find out the starting wattage (also called “surge wattage”) of the fixtures/appliances you listed. The starting and running wattage is normally listed on the manufacturer label. Choose a generator that’s powerful enough to handle the combined wattage of all appliances/fixtures that need electricity. For a rough estimate, you can use a home generator sizing calculator. But to be on the safe side, we recommend having a professional electrician calculate what size standby generator you need. Has run for more than 10,000 hours. Most standby power generators are designed to run for about 5,000–10,000 hours, depending on how well the unit has been maintained. Has needed frequent repairs. Multiple repairs within a short timespan usually mean the generator is on its way out. Repair costs can add up quickly, so you’re most likely better off getting a new unit. Doesn’t operate as well as it used to. The last thing you want is a standby generator that struggles to start up or stay on when you need it most. Poor operation could mean your generator needs maintenance, but could also be a sign that the generator is nearing the end of its life. Can’t keep up with your home’s electrical load. If you recently moved to a larger home or your family is growing, you’re probably better off investing in a more powerful generator that can meet your home’s demands.